AmazonAds is a native extension that enables the use of Amazon Mobile Ads. The API is simple to use and understand, featuring two methods to display ads. The first one displays a banner using a unique string name to identify the ad. The string name used to display the ad can also be used to remove it in the future. The other method displays interstitials ads, which are not identified. A developer can display (or remove) only one interstitial at a time. 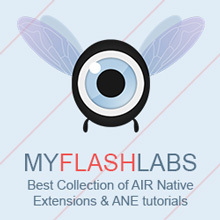 Air Native Extension, Android BSD. URL.